Ashley’s food is already winning plenty of fans. Get to know the man behind the food as Ashley talks home cooking, celebrity dinner parties and what inspires him…. Ashley, 30 is originally from Devon but he now lives in Fowey along with his wife Karla, young daughter Althaya and their dog, Deeli. 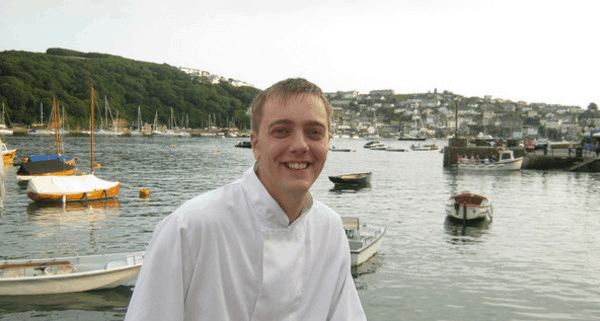 As well as being a chef, Ashley is also self-taught when it comes to butchery and is hoping to use his spare time living by the sea to learn to fish. A: I think I was inspired to cook from an early age by watching Gary Rhodes on a kids TV cookery show, but also I really wanted to be like Steven Segal in Under Siege! Q: What’s your favourite dish to cook at home? A: I like to keep it simple and cook a lovely roast dinner for my family. When I have the time I also enjoy experimenting with sushi – it’s not something we serve in the restaurant but with so much great seafood around it is fun to try out. Q: What do you usually have for breakfast? A: Nothing too exciting first thing in the morning. I’m a big fan of shredded wheat – a great way to start the day. Q: Which celebrities, living or dead, would you invite to a dream dinner party? A: For comedy it would have to be Trey Parker and Matt Stone (creators of South Park), then Gordon Ramsay and Marco Pierre White for entertainment and talking food, plus a touch of glamour from Cheryl Cole and Keira Knightley (don’t tell my wife I said that!). Q: What three luxuries would you take to a desert island? A: My iPod, a gas cooker and a beer making kit. Q: Where did you go on your last holiday? A: My wife and I went to Egypt on a belated honeymoon. The snorkelling was absolutely incredible! Q: Which chefs would be in your fantasy kitchen brigade? A: A tough question but it would have to be David Everitt Matthias of Le Champignon Sauvage in Cheltenham, Daniel Humm of Eleven Madison Park in New York, and Marco Pierre White. Q: What is your favourite cuisine from around the world? A: I’m torn between Italian and Indian… I really enjoy cooking Italian food but having spent a lot of time in Yorkshire I really fell in love with Indian food – you can’t beat a good curry. Q: How do you relax after a long day in the kitchen? A: Usually a quiet dinner and catch up with my wife. Q: When it comes to food, everyone has a ‘guilty pleasure’…what’s yours? A: I’m sorry to say it has to be fried food. I just can’t resist Chinese battered chicken or Tempura. Q: Finally, which restaurant, anywhere in the world, would you most like to dine at? A: It would have to be the 2 Michelin starred Le Champignon Sauvage in Cheltenham. I love their recipe book too… one day!